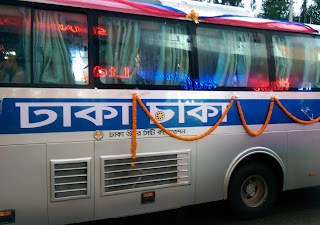 Dhaka Chaka bus service has been started in Dhaka diplomatic zone. This air conditioned (AC) service is availabe in two routes at this moment. Route 1: Tejgaon-Gulshan link road (Navana mor) – Gulshan Shooting club – Gulshan 1 – Gulshan 2. Dhaka Chaka Buses are Wi-Fi enabled. So, passengers can use internet through Wi-Fi.